As you can see on the map, the closest metropolitan area to the population-100,000 Thunder Bay is Duluth, Minnesota. The closest cities in Canada (Winnipeg, Manitoba and Sault Saint Marie) are each an eight-hour drive. It's a 15-hour drive from Thunder Bay to Toronto. This means that Thunder Bay must have a federal building or two as well as a mail processing facility. In the United States mail processing facilities go by a few names: "Processing and Distribution Center (P&DC)," "Processing and Distribution Facility (P&DF)," to name a couple. Canada's facilities go by the term "Mail Processing Plant"  MPP for short. 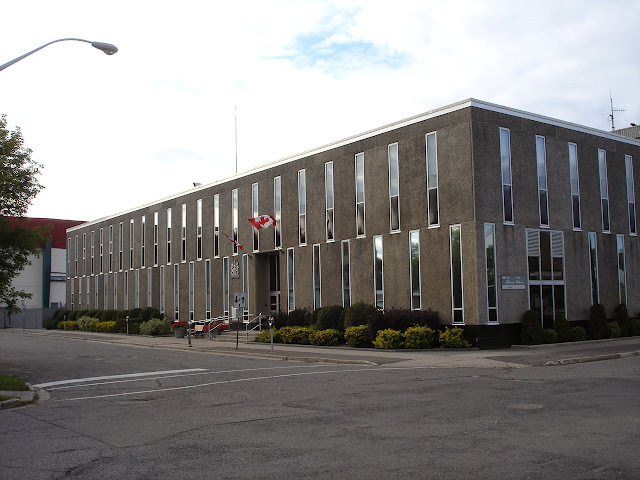 Like some mail processing facilities in the U.S., there is retail service at the Thunder Bay MPP, which also serves as the community's main post office. This is located in the north side of the city along Harbour Expressway. Here's a photo from 2014. The rest of the post offices in Thunder Bay are essentially what we'd call Contract Postal Units (CPUs) in the U.S.; they're retail counters located in stores, in this case branches of Shoppers Drug Mart, a large Canadian chain that you could think of as Canada's CVS. Here's a map from the Canada Post site showing its locations in Thunder Bay. Which brings us to the post offices. 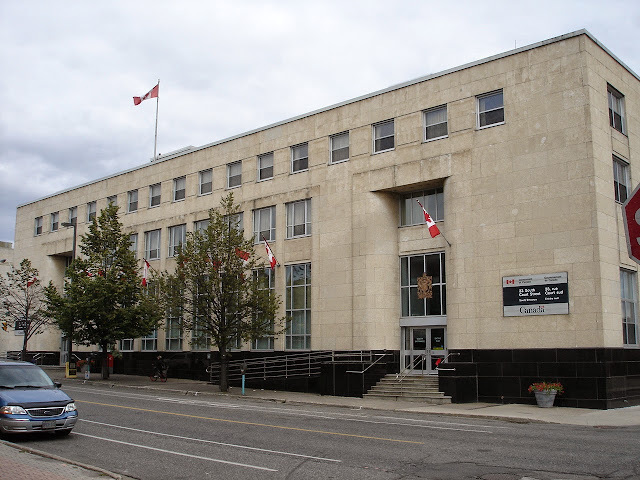 Both Port Arthur (north side of now-Thunder Bay) and Fort William (south side) had their own grand federal building / post offices. Postal retail operations were phased out as the counters in drug stores opened. The Beaux-Arts building was designed and constructed under "the 1934 Public Works Construction Act (PWCA), which was designed to stimulate the economy during the Depression and to relieve unemployment." In other words, it could be considered a cousin of the hundreds of historic post offices constructed in the United States at that time under FDR's New Deal. Stay warm, everyone! Thanks to Skip A., who contributed the photos in this entry. Very interesting! Who knew we had public works cousins in Canada? Shoppers Drug must be the largest operator of retail postal outlets in Canada. 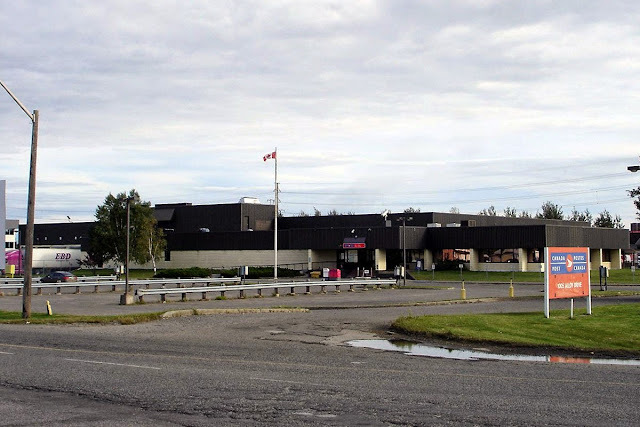 Of the nine post offices in Thunder Bay, eight of them are at Shoppers. The address for the "Old Fort William post office" pictured is 221 N. Archibald. Not sure who all occupies it now - Canadian Grain Commission, RCMP, others. Home delivery is still the norm for the time being in Thunder Bay. The community mailboxes haven't really started here except the ones that were already set up in rural/suburban areas. The parcel delivery by Canada Post in Thunder Bay seems to be contracted out to Eazy Express (you'll see their mostly plain white vans around). If I'm not home for the delivery it ends up at the nearest postal outlet (the closest Shoppers Drug Mart to me). If you want pics of some really old post offices of Port Arthur and Fort William. Here's a couple photos online from souvenir book published around 1900.